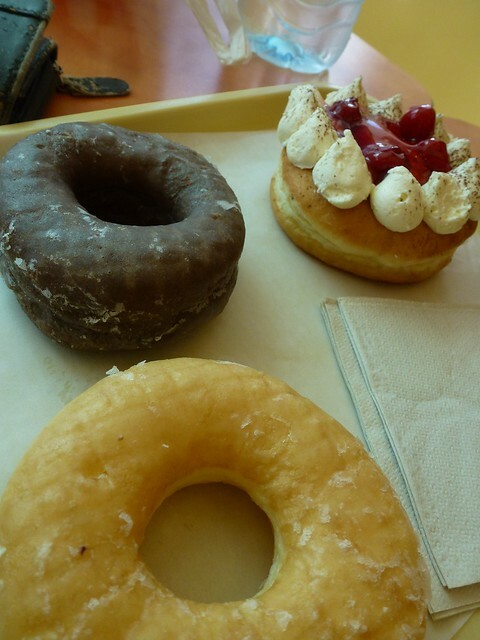 We headed to a shopping complex in the morning to buy some supplies and on the way we stopped off for some donuts! 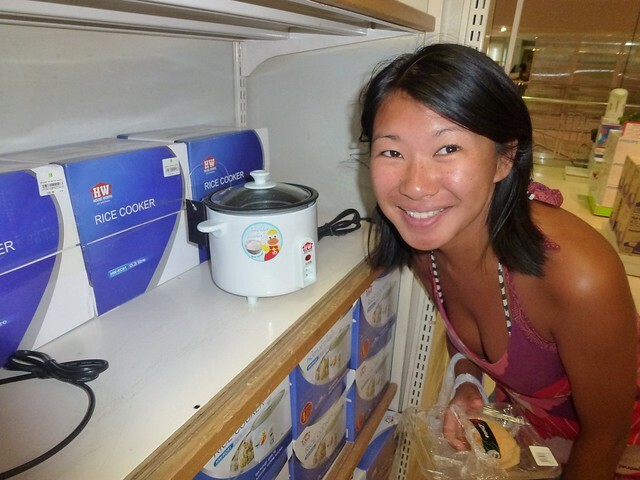 Some of the shops were interesting, the best item we picked out was a tiny rice cooker! We relaxed a bit in the afternoon and then headed out to book a bus and a boat to get to our next destination Koh Phangan. With it heating up John decided it was time to get another hair cut. Once again it cost around £1-2 and it took some time to explain that he wanted his head shaved. We got there in the end, however even with no hair he was still hot. In the evening we headed for the old town again and ate at a little stall on an empty block. We had a very good dish of pad thai. 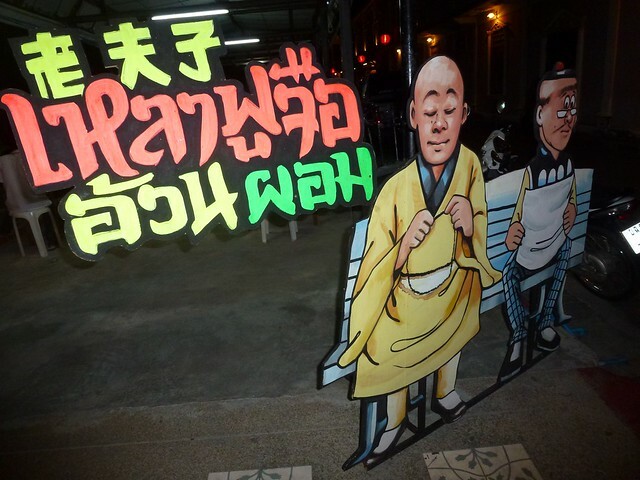 It had a fantastic cartoon sign outside of a monk and another person sat on a bench. No idea what the sign said. 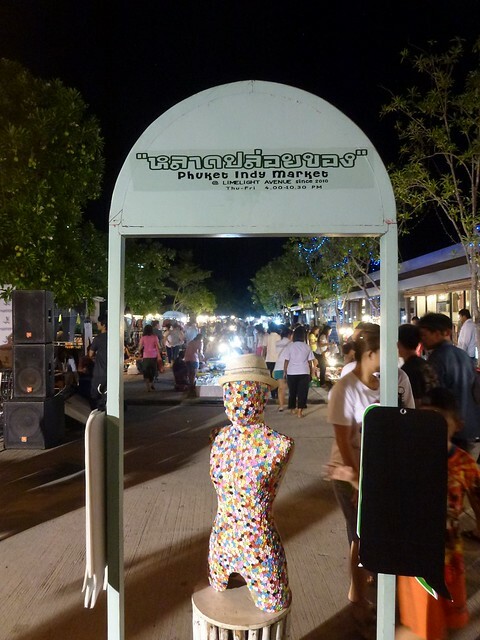 On the way back we ended up stumbling upon Phuket Indy Market, a night market located north of the old town. It was a mix of independent fashion designers, food, music, toys and drinks with goods laid out on the floor as well as on stalls. Really interesting, if only we had a bigger bag! An early start and time to head from Koh Phi Phi to Phuket. Looking back we should have spend more time in Koh Phi Phi but with plenty of other places to see we decided to move on. We decided against staying on the beaches in Phuket and headed to Phuket town. 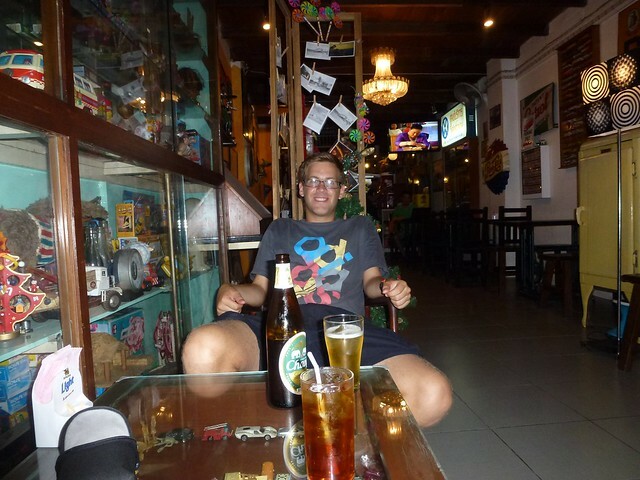 We checked in and stayed at Sleep Sheep Phuket Hostel which was clean and pretty nice but a little on the quiet side. We headed out for lunch just down the road to a small place (which due to the amazing Google maps and John’s crazy memory was this place). 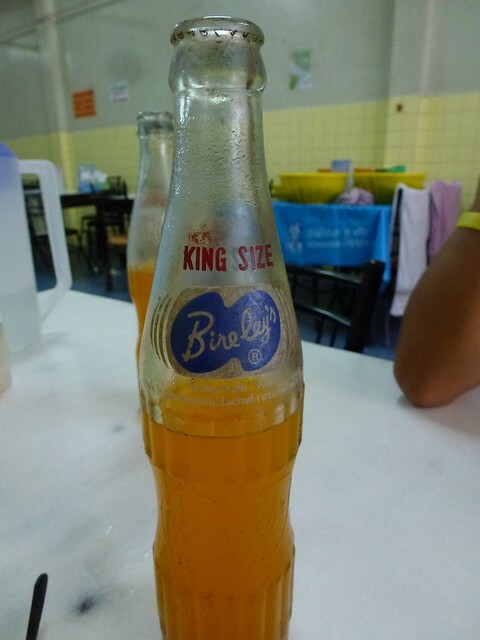 We ordered some drinks which we think had been in the fridge for a few years. To eat, we had a couple of dished included tofu with mint pork. 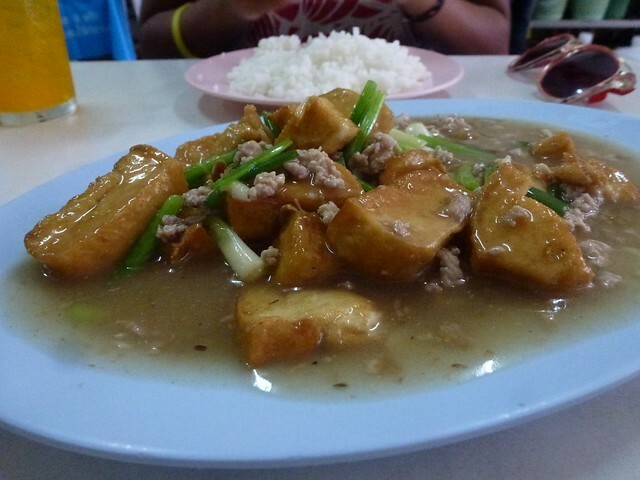 We were really surprised to find mint pork, as mint isn’t generally used in Thai cooking. Turned out it was a typo on the menu and it was mince pork. It didn’t matter as it was really really nice. After the meal we walked around the town admiring the architecture in the old town which was really nice. On our walk, we came across a huge book shop and tried to find some decent books. 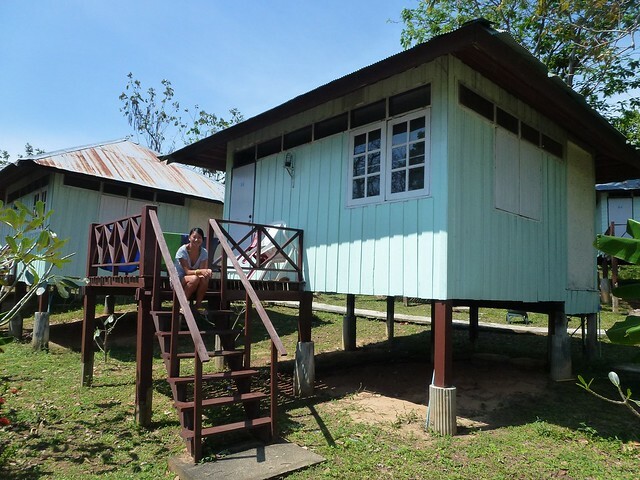 We headed back to the hostel and spent the afternoon chilling out, uploading photos and skyping home. In the evening we headed back into the old town and ate at China Inn Cafe Restaurant. 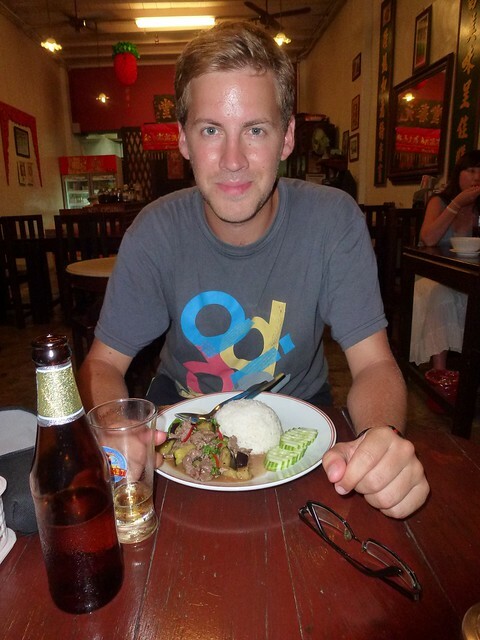 A little more expensive than the street food or local places but the food was really good. After the meal we headed over to Lard Yai Bar just over the road which was filled with kids toys, many we remember from our childhood. We sat back, drank and listed to Jimi Hendrix! 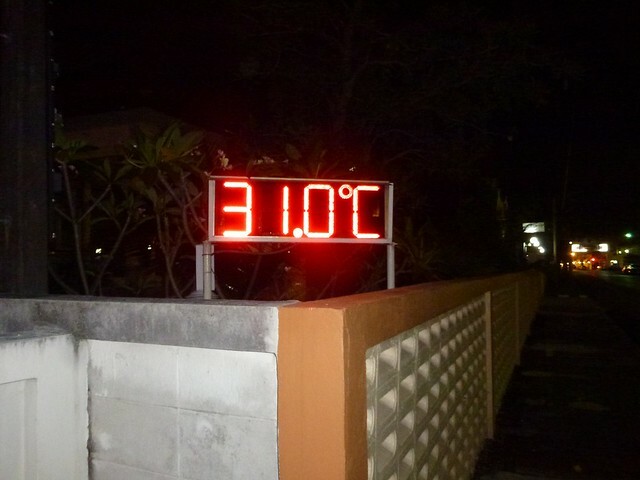 After a few beers we strolled back to the hostel, passing a temperature sign – 31 degrees at night! 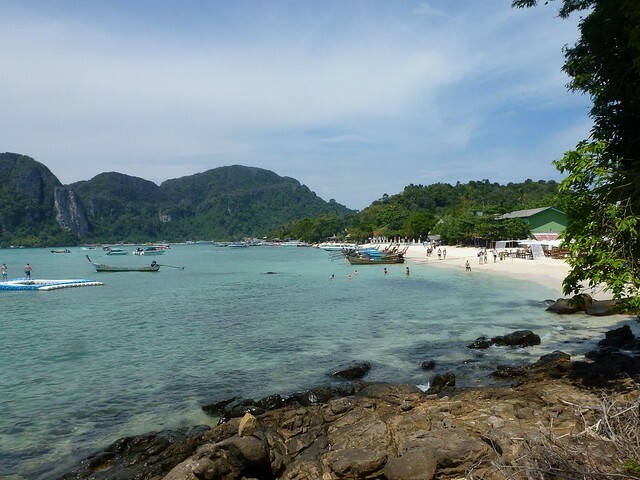 After a great snorkelling tour from Koh Lanta, we’re off on another snorkelling tour from Koh Phi Phi which would also include a visit to the famous Maya beach where the Leo Di Caprio film The Beach was filmed. 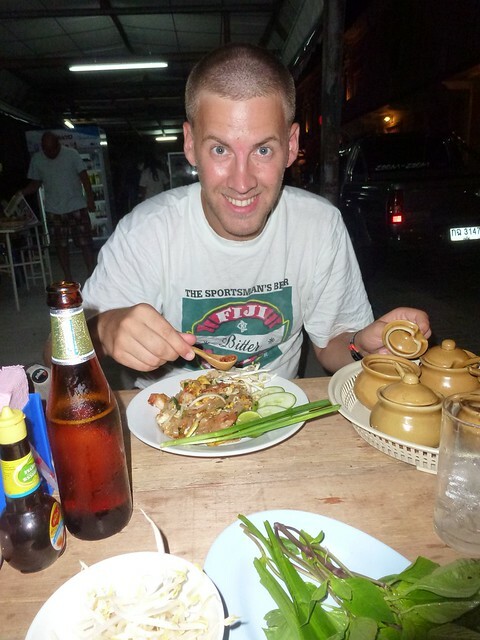 We were up early and given rice and curry for breakfast to give us the much needed energy for a day of snorkelling. In our tour group, we met a nice English couple and a French girl who were all very interesting. Our first stop was Shark Point near to our resort. John was an eager water baby and was the first to jump in. As soon as he hit the water, the fish flocked around him and had a few nibbles. Then someone through a Dorito crisp in the water which sent the fish crazy. 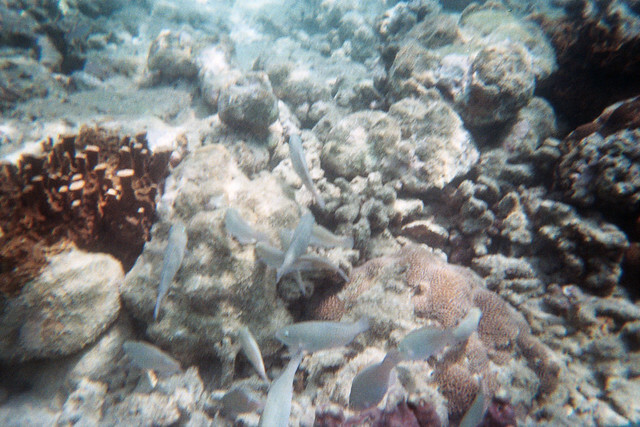 It was amazing to see the small tropical fish surrounding us. The water was so clear and with the amount of fish in there, it was actually amazing to see them swim up so close to your mask. Our next stop was Bamboo island where we did more snorkelling and then we headed to the north of the island where we all settled for some lunch of fried rice and chicken on the white sandy beach. It’s crazy how peaceful and beautiful the place is. After lunch we headed to a cave. I was a bit too chicken to go in the cave. Due to the language barrier, I was under the impression that the guide would lead you through a cave which you had to swim underwater to get to the other side. That scared me a bit so I decided to not go in and just swim around the water instead. The group emerged not too long after and all they did was snorkel through the cave and at the exit, they passed a wall of fish all swimming together. I ended up seeing this from the other side so I dont think I missed out too much. 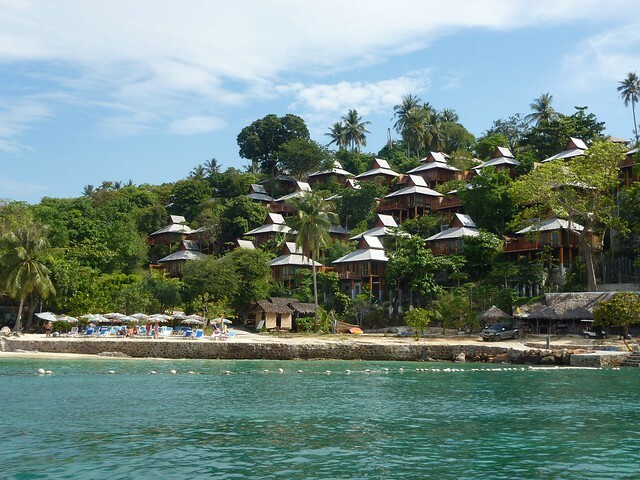 After some snorkelling here, we then headed over to Monkey Beach. From the boat we had to swim to the beach where there actually were only two monkeys which seemed quit well behaved. After a few picture opportunities, we headed to Koh Phe Phe Le where there we more snorkelling opportunities and a cave with loads of colourful coral. 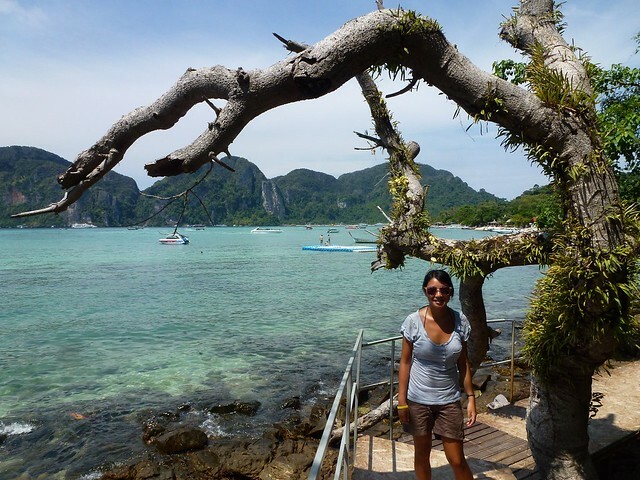 And finally, our last stop was Maya Beach. We arrived via the back entrance where we had to swim to shore and then walk about 10 minutes to the beach. We weren’t massively impressed though as the place was packed with tourists, the tide was out and the water was full of tour boats – nothing like in the film unfortunately. Eventually, we found our boat among all the others and on the way back, it stopped by a rope swing. John was the first up and grabbed the rope swing jumping from the boat. Always so enthusiastic! 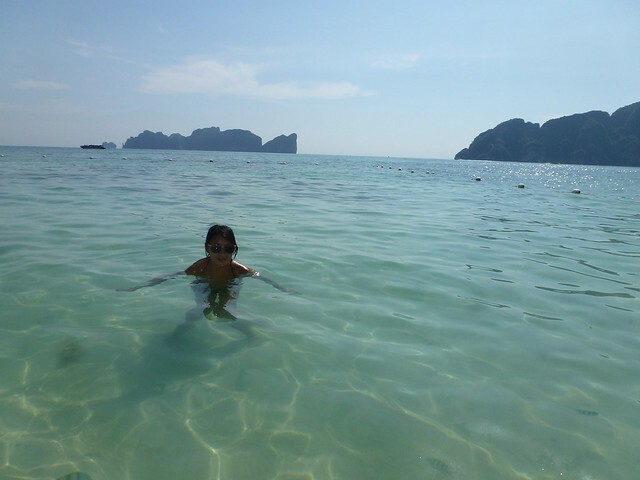 Overall, it was a great day despite the disappointment of Maya beach. In the evening, we ate at our resort where I ordered a pineapple fried rice which, to my surprise, was served in a whole pineapple. After dinner, we had arranged to meet up with the English couple and French girl for a beer. As we were sat on the beach having a few drinks, a girl suddenly came running over shouting my name. 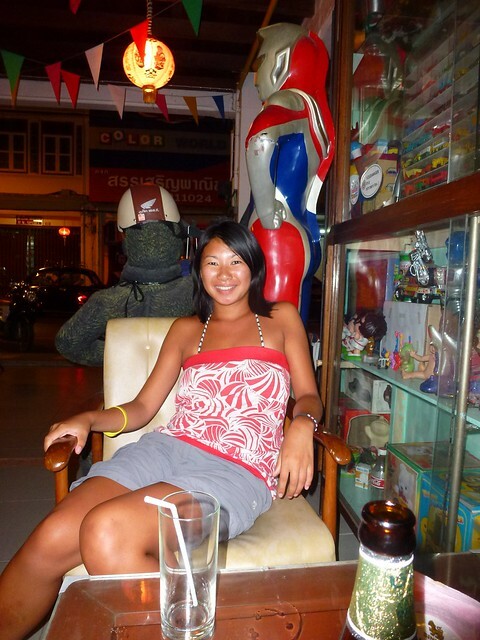 I looked up and it was Aymi Lee, a friend of mine from Manchester who I knew was travelling in Southeast Asia but had no idea where exactly. What a small world! She was with her boyfriend and they joined us for a few drinks as well. Bit random and strange to bump into someone from home on a small Thai island, but it was great to see them both! Overall it was an amazing day and evening and I’d do it all over again if I could. Moving onto Koh Phi Phi which, for some, is the best Thai Island. 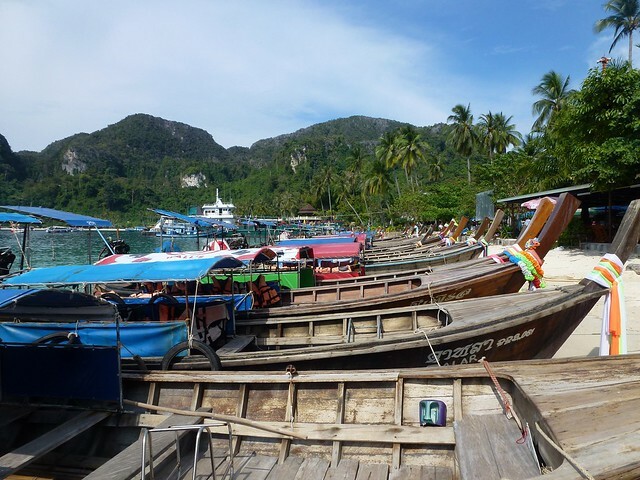 We had a short ferry ride from Koh Lanta to the main port in Koh Phi Phi and then onto a little longtail boat to the very east of the island to the Phi Phi Hill Resort where we were staying. Because we had pre-booked a room, the hotel’s longtail boat knew to pick us up which saved us from paying for a longtail boat to take us there. As the name suggests it was at the top of a hill. 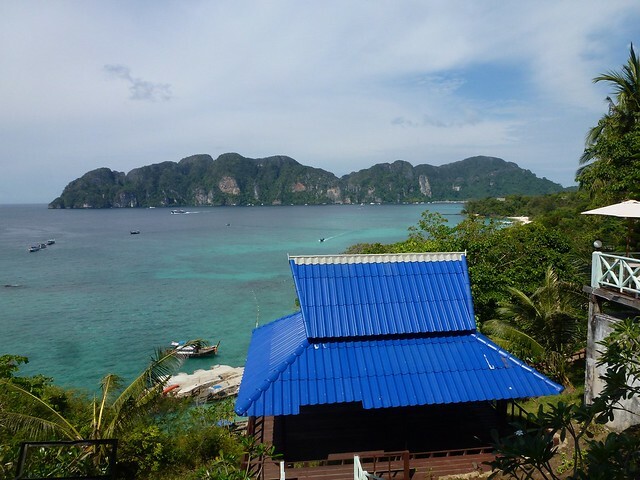 Great views and a big bungalow all for 750 baht (£16) a night. As the resort is on a hill, there’s a bit of a walk up the stairs to get there. To help, there is a small lift / train to take your luggage to the top – a nice little touch. 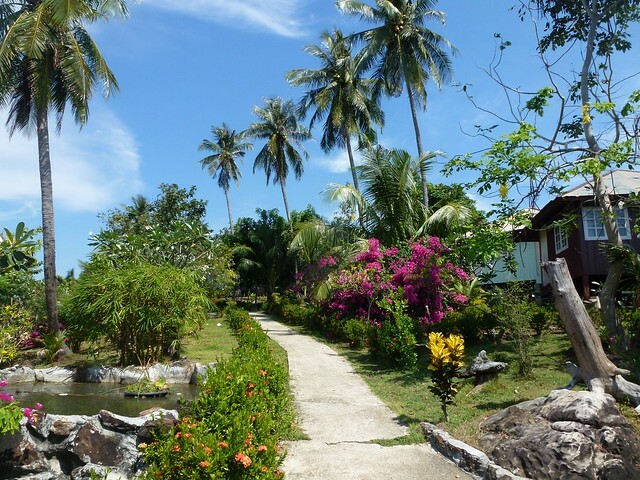 The resort was really nice, spaced out with our little hut on the far side with a good view of the gardens and sea. We walked into the main town (village) which was a bit of a trek along the beach and the rocky areas but good fun. 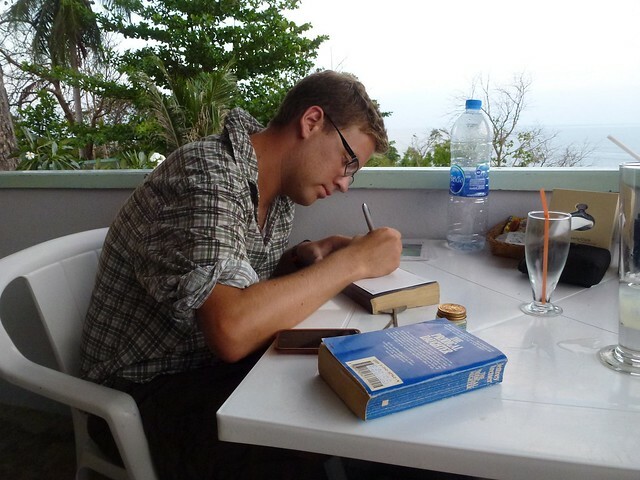 We ate, and then bought loads of postcards and booked for a snorkelling tour the next day. 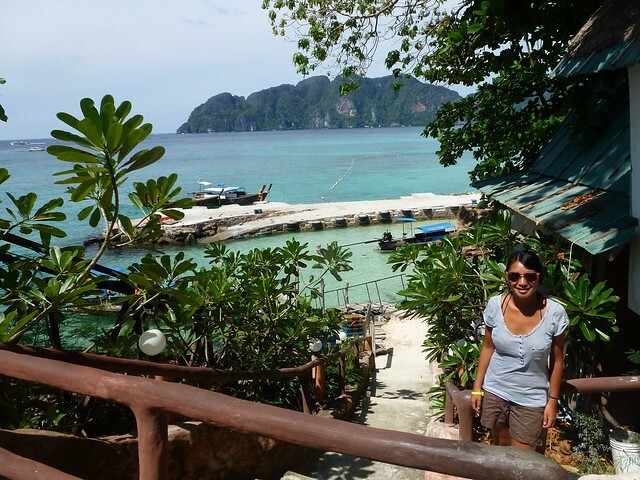 Koh Phi Phi is a really small island compared to many of the Thai islands we would visit. The small town at the centre is a warren of small passage ways with various stalls, diving shops and bars. We were soon out of the there and back to Long Beach which was next to our resort. But I was the only one enjoying the sun and clear water as John stomach decided to go and he had to make a dash back up the hill and to our bungalow. I spent some time on the beach, the water was amazing with loads of tropical fish and at a couple of degrees cooler than the air, it was a welcome break from the heat. 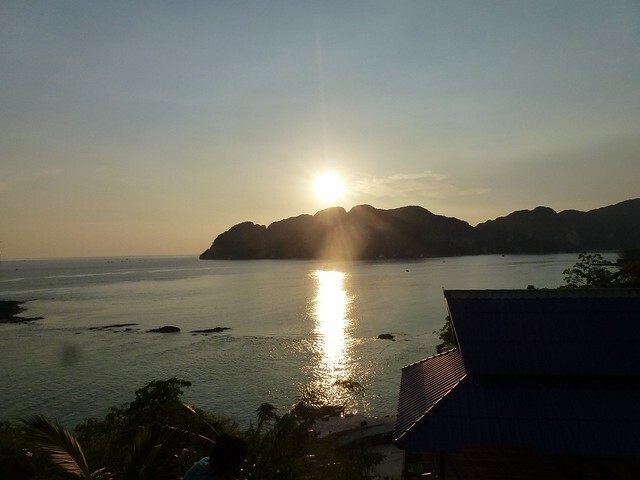 In the evening we headed to the bar / restaurant that looks out over the west of the island and Koh Phi Phi Lee which we would be visiting tomorrow on the snorkeling tour. We ate in the resort overlooking the bay as the sun set, wrote some postcards and enjoyed the food, drink and view! 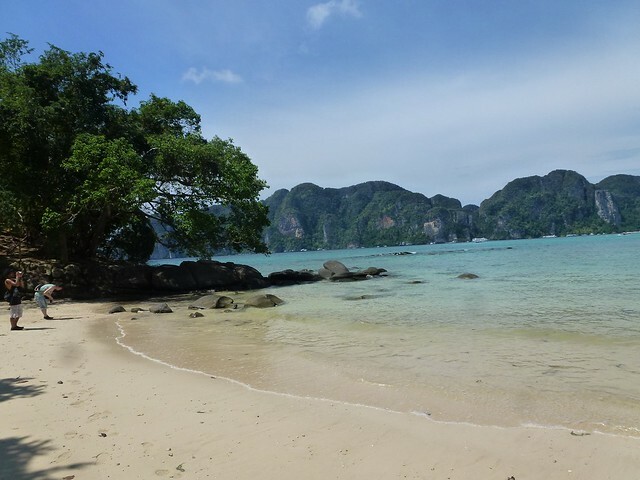 It’s easy to see why Koh Phi Phi is one of the most popular locations. 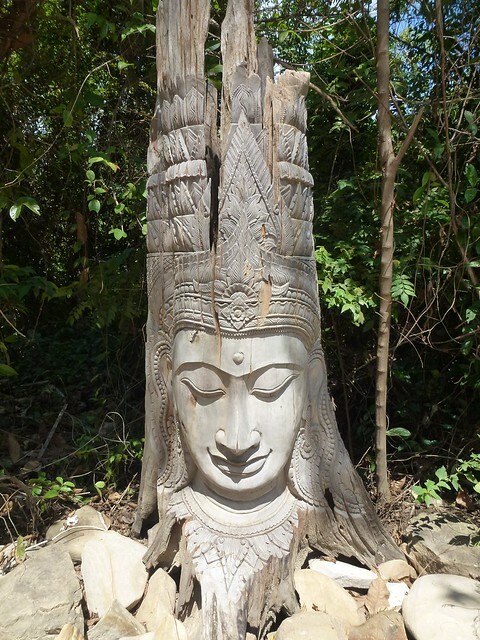 We were picked up in the morning and taken to the south of Koh Lanta. 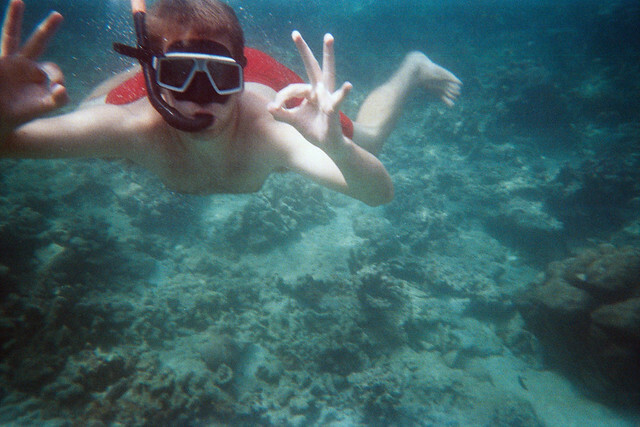 It was one hour on the boat to the first snorkelling area. There were loads of fish around the boat but not much coral. Next up was the emerald cave. There were load of boats at the entrance of the cave. We jumped in and began to swim. 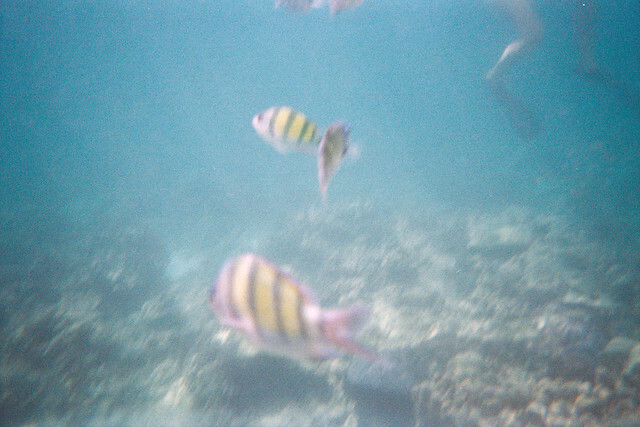 People were feeding the fish right next to us so we were surrounded by hundreds of little tropical fish everywhere. It was amazing! The cave was pitch black but halfway there was a massive group of around 80 people in a huge conga. There were even people holding up babies in the cave! Once through the cave, there was an amazing beach in a cove, there was no other way into the beach but the cave. After relaxing for a bit in the cove, we swam back out. I slowed John down and we were the last back to the boat. The third spot had great fish and lots of variety but loads of jellies. We we getting stung so we made a dash back to the boat. At the last island, we ate our lunch provided by the snorkelling company on an amazing beach with really clear water. After a swim we headed back. Once back to the bungalows we had a quick snack and chatted to the resort workers. We went out for a meal at a little place on the main road. It was a long day but very fun.